The Western Belfast Bypass (WBB) is a new four-lane, median separated motorway bypassing Belfast and running from the existing Northern Motorway to join Johns Road south of The Groynes entrance. The Western Belfast Bypass (WBB) is part of the Western Corridor, a part of Christchurch's Roads of National Significance programme. When completed it will improve access between the north of Canterbury/Christchurch, the Christchurch International Airport and the industrial area at Hornby. Reduced congestion with shorter and more predictable travelling times. Vehicles numbers on the Main North Road will be halved. Road safety will be improved. Lighting will be designed to minimise glare while meeting safety requirements. Landscaping will reduce the impact of the road on its surroundings. Improved access to the north and west of Christchurch will support growth and employment in north Christchurch and Canterbury. Work on the Western Belfast Bypass (WBB) in Christchurch is completed as this drone footage shot in October 2017 shows. For more WBB videos, visit the Transport Agency YouTube playlist(external link). Why is the Western Belfast Bypass needed? 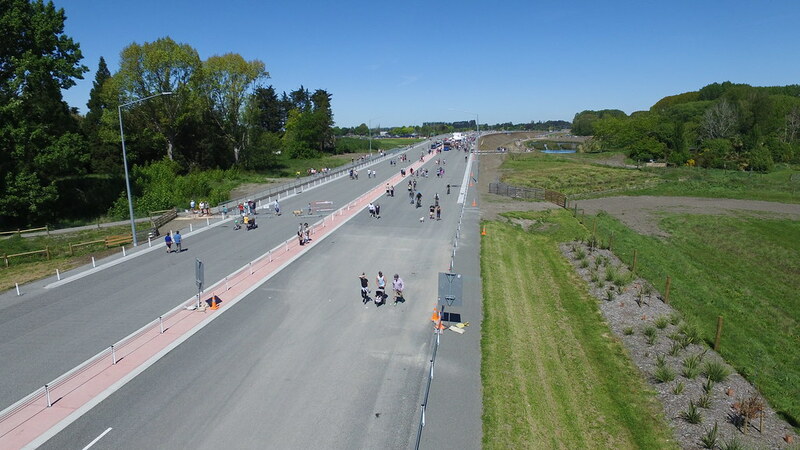 The bypass will reduce traffic volumes, reduce congestion, and improve public health and safety for driver entering and exiting Christchurch from the north and for communities in this area. What are the benefits of a Western Belfast Bypass? For motorists the bypass will reduce congestion, shorten travelling times and improve safety. For the residents of Belfast fewer vehicles on Main North Road will make it less congested, safer for walking and cycling, and easier for public transport to run efficiently. Noise and air pollution will also be reduced, improving the quality of life for Belfast residents. What consultation opportunities are/were there for the local community? We will continue to work with local residents and businesses to keep them informed and ease effects from construction or traffic management. This information is provided on the consultation page. How many lanes are proposed along the Western Belfast Bypass? The Western Belfast Bypass (WBB) will have four lanes (two lanes in each direction). A median and safety barrier will separate on-coming traffic. Will the Western Belfast Bypass reduce traffic on Main North Road and Johns Road? The bypass will greatly reduce traffic volumes on Main North Road and the northern end of Johns Road. 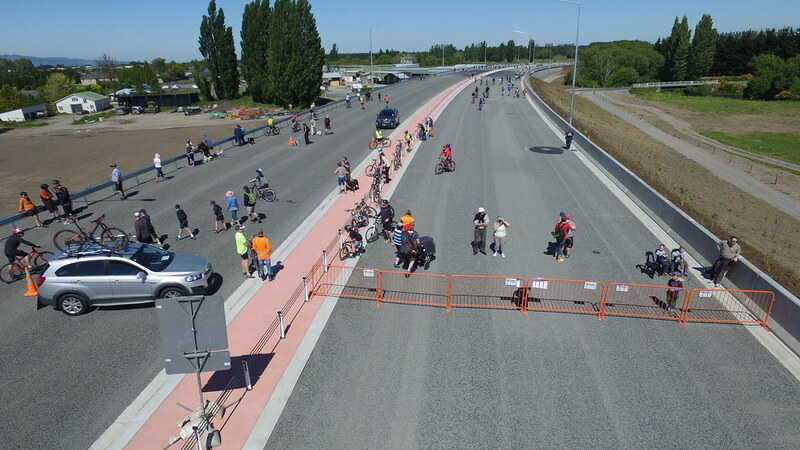 On opening we expect the bypass to remove about half the traffic from Main North Road, reducing congestion and making these roads safer for cyclists and pedestrians. Where will access onto the Western Belfast Bypass be provided and where can you exit the Western Belfast Bypass? The Western Belfast Bypass will replace the existing SH1 connection between the Northern Motorway and the Western Corridor along Main North Road and Johns Road. Motorists travelling south on the Northern Motorway, or north from the airport will be able to use the Western Belfast Bypass. People in the Belfast/Johns Road/Main North Road area wanting to travel north on the Northern Motorway will continue to head north out of Belfast on what is currently the Northern Motorway. A northbound on-ramp will provide access onto the motorway. People in the Belfast/Johns Road/Main North Road area wanting to travel south towards the airport will be able to access the Western Belfast Bypass via a new southbound on-ramp at the interchange located at The Groynes. There will be no northbound on-ramp onto the Western Belfast Bypass from The Groynes area. Motorists travelling south along the Northern Motorway will be able to exit the motorway to travel directly into the Belfast area. There will be no southbound off-ramp to The Groynes area. Motorists travelling north along Johns Road from the airport will be able to exit at the south end of the Western Belfast Bypass via an off-ramp to access Belfast and the Groynes. What is happening to the entrance to The Groynes? Ensuring safe public access to The Groynes is a top priority and we are working with the Christchurch City Council (CCC) to ensure the bypass supports the CCC's development plans for The Groynes. Vehicle, cycle and pedestrian access will be provided in much the same location as now but it will be via an underpass with the new bypass running over the top. Is any part of The Groynes required for the Western Belfast Bypass? Following the consultation completed in 2010 the alignment of the Bypass has been moved further to the east. As a result the separation between the Bypass and The Groynes has increased, and is now completely clear of both the historic pump shed and the dog park. The alignment still overlaps with a portion of The Groynes at the southern end of the bypass near the current entrance point. We are continuing to work with the CCC to minimise any impacts on The Groynes and are investigating opportunities for improvements too. What is happening to the dog park? Access to the dog park will be retained near the current entrance. The bypass does not require any of the dog park land. What is the proposed speed limit? The speed limit on the Western Belfast Bypass will be 100km/h reducing to 80km/h at the interchange with Johns Road. Landscaping and urban design elements such as median and shoulder widths will be varied to slow traffic where the speed limit reduces to 80km/h. How high will the motorway be above ground level? The motorway will be constructed as close to ground level as possible. Drainage requirements mean that portions of the alignment will be elevated up to 2m above ground level. Flyovers will be constructed where local roads pass under the Western Belfast Bypass, which will elevate the bypass up to six metres above surrounding ground level at these locations. The NZ Transport Agency Noise Guidelines and the NZ Standard for Road Traffic Noise are used to determine existing and predicted noise levels and ways to avoid or manage noise impacts. Noise surveys have already been carried out, as has a modelling exercise using the future traffic flows to predict noise from traffic using the new road. The results of the modelling have been used to identify potential mitigation measures. Next we will develop and analyse a range of options to determine what is the most appropriate. Mitigation options may include landscaped buffer zones, barriers and low-noise road surfacing. When is construction starting on this project? The first sod was turned by The Hon. Simon Bridges, the Minister of Transport on Wednesday 13 May 2015. Information on the timing and staging of construction will be available soon. The project is expected take about 3 years to complete. How much will the Western Belfast Bypass Cost? The project is expected to cost between $85 and $125 million. What relationship does the Western Belfast Bypass have with the Greater Christchurch Urban Development Strategy (UDS)? The Western Corridor is a key component of the Greater Christchurch Urban Development Strategy (UDS), the 35-year plan for managing growth in Greater Christchurch. The UDS integrates planning, funding and implementation of land use, transport and infrastructure provision. 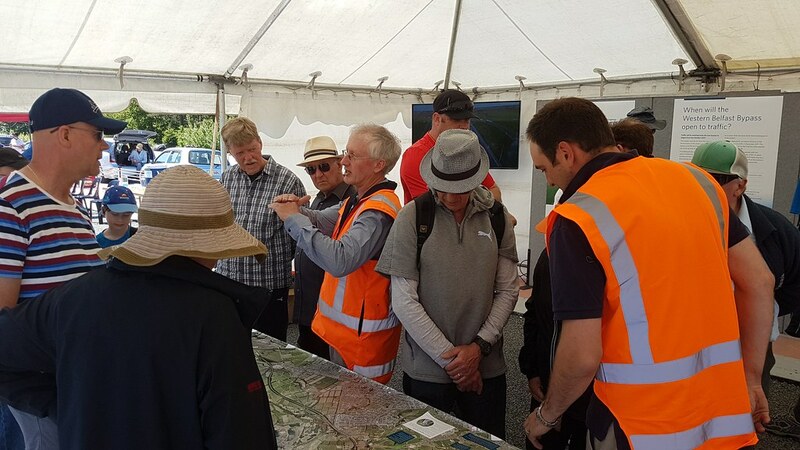 The UDS partners are the NZTA, CCC, Environment Canterbury, Selwyn District Council and Waimakariri District Council. The UDS considers access from the north of Christchurch to the airport, the industrial area at Hornby and destinations to the south as critical for the long-term economic growth of the Greater Christchurch area. The Western Belfast Bypass is a critical component for achieving the UDS vision of a sustainable transport system that supports prosperous communities. How does the Western Belfast Bypass fit into the Belfast Area Plan? The Belfast Area Plan, prepared by the CCC under the UDS umbrella, provides a strategic direction for managing the growth of Belfast and identifies the Western Belfast Bypass as critical for successful implementation of that plan. Belfast is a key growth area in the UDS, and the bypass will enable better development of the growing community by significantly reducing the traffic volumes along Main North Road and Johns Road.